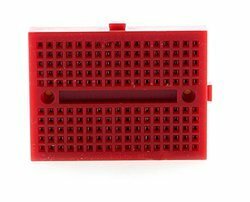 Offering you a complete choice of products which include 170 tie-points mini solderless prototype breadboard, 4wd smart motor robot car chassis and sensor tec 12706 cooler peltier module. Motor speed The actual load speed is 7.2V battery power, and the speed is about 40CM/S. 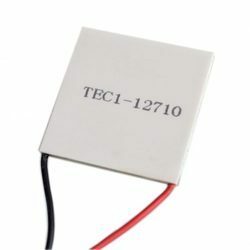 Thermoelectric Peltier cooler, primarily consists of semiconductor material sandwiched between two ceramic plates and are used in numerous applications from CPU coolers to alternate power sources. A thermoelectric cooling (TEC) module is a semiconductor-based electronic component that functions as a small heat pump. By applying DC power source to a TEC, heat will be transferred from one side of the module to the other. It creates a cold and hot side. They are widely used in industrial areas, for example, computer CPU, CCDs, portable refrigerators, medical instruments, and so on. Get ice cold in minutes or heat to boiling by simply reversing the polarity, used for numerous applications from CPU coolers to alternate power sources, or even for your own custom car warmer/cooler. This module is a 12V module, and is rated for ~72W max (up to 14V/6A) but when used with a regulated 12V output they don't draw more than 5A so we suggest our 12V/5A power adapter for use. Operating Temperature: -30? to 70?. TEC devices can also be used for generating electricity by simply heating the once side. Looking for educational robot ?